Take screenshots you can search. Screenotate is a screenshot-taking tool which works just like macOS's screenshot tool – one keyboard shortcut and drag – and it uses OCR (Optical Character Recognition) to recognize text in your screenshots. It's available for macOS and Windows. Download Screenotate 2.1 for Mac now! See Notes if you get an error about Screenotate not being "commonly downloaded." Want to hear about feature updates or versions for iOS, Android, and other platforms? "Wait, where did I see that?" Screenotate records useful metadata, not just text. It can get the title of the window, originating URL, time the screenshot was taken, and more. Each screenshot is a self-contained HTML file on your computer, which you can open up in your Web browser or share with friends. Never lose a screenshot again. Using Screenotate's menu pane, look at recent screenshots and quickly search your past screenshots. You can even drag and drop images directly from here into a chat with someone! Click a screenshot to open it up in your browser, or right-click to reveal the screenshot file in Finder. Your computer, not the cloud. Unlike many notetaking, screenshot, and OCR services, Screenotate is a desktop app, not a cloud service. The OCR engine runs on your computer, not in the cloud. Your screenshot data never leaves your computer, unless you put your screenshot files on a service like Dropbox or iCloud yourself. And as long as you have the HTML files around, you'll always be able to search and view your screenshots, even without Screenotate. Choose the shortcuts you want. On macOS, Screenotate can automatically replace the Apple screenshot function and use the same shortcuts, Shift-Command-4 and Control-Shift-Command-4. Or you can customize its shortcuts yourself. You can also set where Screenotate should save screenshots. Screenotate requires Mac OS X 10.9, Windows 7, or newer. Windows users: You may receive an error about Screenotate not being "commonly downloaded": right-click the file in browser Downloads and click "Run Anyway" or "Keep." If you get a separate Windows Defender SmartScreen warning when first running, click "More info" and then click "Run anyway." I'm working on signing Screenotate and building reputation to avoid this. Screenotate currently only supports OCR in English. Let me know if you're interested in multilanguage functionality. Screenotate uses the modern LSTM-based version 4.0 of Google's popular Tesseract OCR engine, but it isn't perfect. In particular, it might not work as well on non-Retina (lower-DPI) displays. If you set Screenotate to use Shift-Command-4 on Mac and then uninstall it, you might want to re-enable the original Mac shortcut. 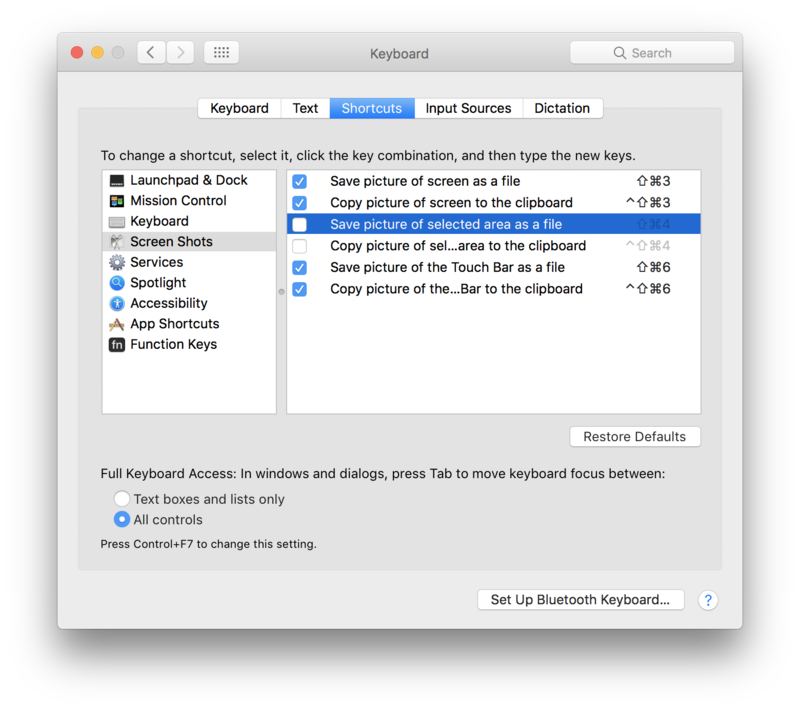 Go into the Keyboard section of System Preferences and re-enable the two original Mac screenshot functions under Shortcuts there. At the moment, Screenotate can find and store the URL for screenshots from Chrome and macOS Safari, but not Firefox or other browsers. Though Screenotate detects the correct window title for any window (active or inactive), its URL detection is not as solid: if you take a screenshot from any browser window, it will capture the URL of the frontmost window of that browser. The camera icon is from Kidiladon on The Noun Project; it's licensed under Creative Commons Attribution 3.0. Screenotate includes the Tesseract OCR engine, prerelease version 4.0, under the Apache 2.0 license. Omar Rizwan wrote Screenotate. Reach out at contact@screenotate.com!